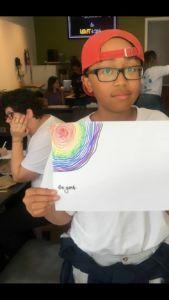 As summer draws to a close, the time has come to also say goodbye to Me to We Take Action Campers, who CONC’s LOFT Kitchen has been lucky to host this past July and August. 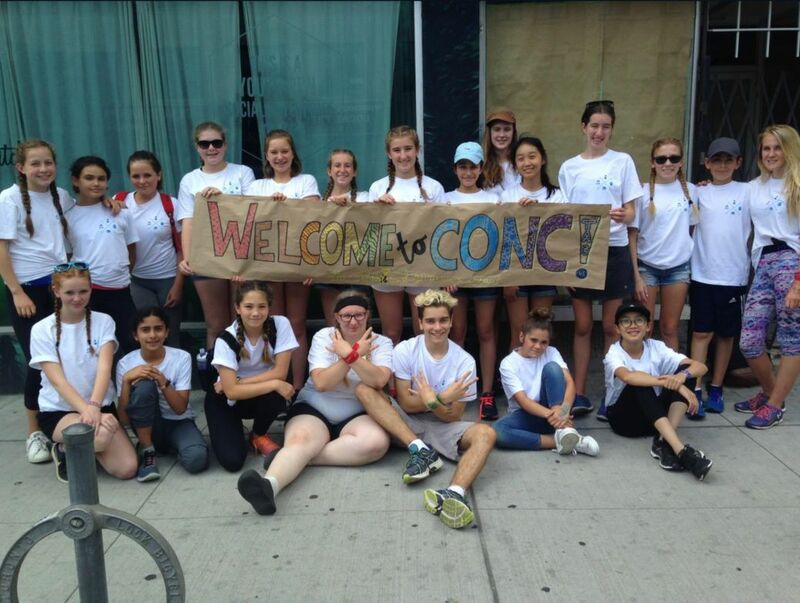 Campers, ages 10-17, were bused in weekly from the Take Action camp ground in Bethany, Ontario, to learn about social enterprise, homelessness and poverty interventions while actively giving back to our community. 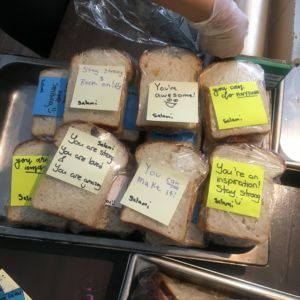 They made sandwich lunches for our shelter, participated in drop-in programming and created signs and banners for community events, such as the Bloorcourt Summer Street Festival! In addition to walking up and down the sidewalks in their brightly printed t-shirts, our campers welcomed a new neighbour, Saving Gigi, with a song! Campers with a sign they made for one of our star volunteer’s last day. Take Action Campers are encouraged to build confidence while developing leadership skills to “reveal the world-changer within!” It is connected with the We Charity, founded by Craig and Marc Kielburger, social entrepreneurs and the co-founders of a family of organizations dedicated to the power of WE, a movement of people coming together to change the world. Alongside a lengthy body of charitable work, WE has created a holistic development model called WE Villages, helping to lift more than one million people out of poverty in Africa, Asia and Latin America; while also developing programming in Canada, the U.S. and the UK with WE Schools and WE Day, engaging over 2.4 million change makers a year. Thank you to everyone who helped to make the 2017 Me to We Take Action Camp experience a success!